What Should You Stock in your Medical Preps? I recently got into a discussion with someone about what medical preps to put in your supplies. His theory was that you should not put in anything you don’t know how to use. This includes medications, surgical instruments and sutures. Now this disagrees with my theory, I know a couple of intensive care nurses, a dentist and a doctor that live not to far from me. They are not preppers, so I suspect they would not have many medical supplies at home. I think it will be easier to find trained medical people than the medication and instruments. Now when I talk about storing medications, I am not suggesting that you store illegal drugs. Do not violate the law it is not worth it. There are many good OTC (over the counter) medications that you can get at your local pharmacy 15 Over the Counter Medications Preppers need to Stock. 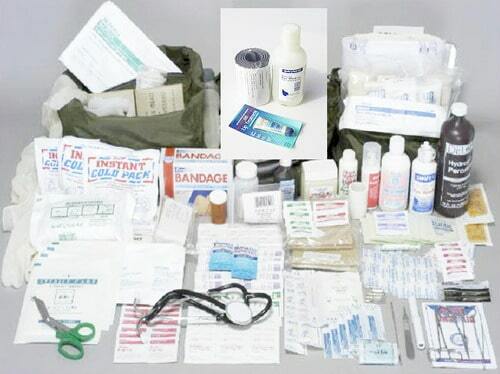 Medical instruments can be found at many internet websites. Not to long ago, I purchased a box of about a dozen US made hemostats in a garage sale for one dollar. Now I am not saying that my friend is wrong in wanting to learn to use everything that he has in his medical preps. I think that we should all try to do this. But in some areas, it may not be practical. Find out which of your friends and neighbors have medical training. Don’t forget to keep yourself in good shape to minimize the medications that you require. Improvised Autoclave, How to Make One to Sterilize Your Medical Equip. This entry was posted in medical and tagged medical preps. Bookmark the permalink.